If you have children then I am sure you are aware of the danger there is anytime there is a pool around. Children seem to be drawn to water like a moth to a light at least I know mine are. I do not worry to much about the boys being around water because they have had swimming lessons and are comfortable with swimming on their own. However Sweet Pea loves to be in the water but does not know how to swim yet without assistance. We have to keep a close eye on Sweet Pea while at my in-laws house because she will go and try to get into the pool herself. We try to keep the ladder out of the pool when it's not being used but we have caught her using other things as stools trying to get into the pool. Now thanks to the iSwimband I do not have to worry quite as much about Sweet Pea getting into the pool without us knowing. The iSwimband is a portable drowning detection system. The iSwimband provides parents with a simple, portable and expandable system to monitor children, adults and pets around water. While it should not be used as a replacement for proper supervision. 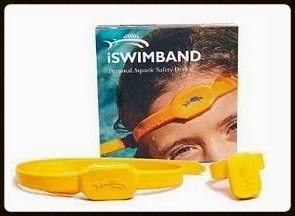 The iSwimband provides an additional aspect of safety and peace of mind by reducing the risk of preventable drowning. The iSwimband will alert my phone if Sweet Pea enters the water or is under the water for 20-30s. The iSwimband does not detect water but rather if the person wearing it is submerged. That is why I keep it on Sweet Pea's wrist because if she tries to get into the pool herself she will have to try and reach one of her floats which would cause her to submerge her wrist. Your iPhone/iPad/iPod Touch alerts you if a swimmer remains submerged for too long, or if a toddler enters the water without your knowledge or close supervision. Comfortable, lightweight headband can also be used as a goggle strap. Tamper-free wristband fits most toddlers or attaches to pet collars. One-time setup takes only a few minutes. Works along with goggles and swimcaps. Monitors up to 8 iSwimbands per iOS device and is expandable. Range up to 100 foot/ 33 meters (will depend in weather conditions). Includes free companion iSwimband app with auto-updates via Apple's App Store. Compatible with Apple iOS7 and greater. Developed with the guidance of leading aquatic safety experts. iPhone 4s +/ iPad 3+/ iPod Touch 4+. Android and Windows mobile versions coming soon. With having four children and spending lots of time at the pool and lakes in the summer I am so thankful to have been given the great opportunity to review such a life saving device. I would recommend this device to anyone who has children or watches children. This is fabulous! My older children live in apartments. The pool is supposed to be locked at night, but it isn't always done. This would help me not worry about my grandchildren! Sounds like a great idea. I would have loved to have one when Jace was younger.